The sheet metal sails seemed to have momentarily stalled and the power had gone out around 4pm, so the children cautiously left the humid bathroom and came back out to the living room. Lack of windows made the room safer but it also contributed to lack of oxygen. Their next door neighbors had come over and the adults were sitting around the Coleman lantern drinking. The wind had died down a little but now picked up again, and after a particularly powerful blast, there was a series of booms that sent them rushing to the windows to peer around the beds to see what had gone down. The air was suddenly filled with swirling waves of leaves and splinters and vines that wrapped themselves around any still standing object. “What the hell was that?” shouted Jean. “The only tree big enough around here to produce that much mulch is the banyan on the edge of Tafuna,” mused Larry. 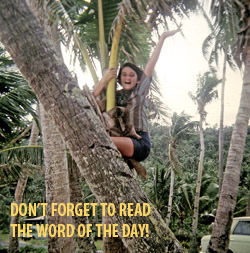 “Oh, no,” moaned Chrissie, for the banyan tree was her favorite place to hide and climb. There were several troll dolls stored there for later use, or had been. Now they were apparently in the upper atmosphere somewhere, swirling through the clouds toward Tonga. “Radio reports from Western Samoa, eighty miles away started calling it a hurricane when it hit there, and the forecast was for a full scale hurricane to hit us about midnight. We ate an early dinner of hot dogs because we felt the power would go off – which it did, about fifteen minutes after we ate. The party we were supposed to attend that night was cancelled, but Pat and Rex had stopped over when they saw our light. We decided to use up the ice cubes before they melted, and since plain ice cubes don’t have much taste, we added Canadian Club to them for flavor. Along about the third drink, Jean was ready to go out and fight the hurricane single-handed, but we persuaded her to remain inside. That girl will never be a drinker. The storm was so bad about then that Pat and Rex didn’t want to leave so we sat around and talked until the lantern went out. I had dragged mattresses from the bedrooms to put them in places where they might be protection from the flying sheets of metal. I put one in the kitchen (which is protected by the door) and another in the front room with the table in front of it. I don’t think anyone really slept much – I know I didn’t. Chrissie came crawling into bed with me after a while and the two of us finally went out and crawled in with Carolyn because I was on the box spring and it was miserable. The rain was blowing in on my face and the springs were sticking in my back and I had to lie in a position where Chrissie could hang onto my hand, so all in all, it was pretty uncomfortable. We could hear the metal roofing sheets ripping off during the night and kept expecting them to come tearing through the house at any moment. The eye of the storm passed over around 2 am and a temporary, eerie quiet settled over the island. But the calm was short-lived, and as the wind slowly started to pick up again, it was joined by a guttural yowling, a noise so primal it chilled their already goose-bumpy arms. Tucked away in a box in a closet and driven by tidal forces and low barometric pressure, Nefertiti the cat, ancient Egyptian Queen in a former life, gave birth to a fine young prince. He was not named Tutankhamun, but called Afa, which means hurricane in Samoan. For such a dramatic entrance into the world, he turned out to be a pretty ordinary cat.